“At one time we only fed acorns to pigs. Now we eat the acorns,” says Joana Alegrete. “Have you heard of the pastéis de bolota?” I hadn’t. Alegrete is a spa therapist I meet at the Alentejo Marmoris Hotel in Vila Viçosa in the heart of Portugal’s vast Alentejo region spanning roughly one-third of the country. Bolota, or acorns were traditionally fed to farm animals. Today, much research has gone into the nutritional value and suitability for human consumption, and you can occasionally find bread made from the flour. In the nearby town of Alandroal, Rui Coelho, a pastry chef for over 40 years, developed a recipe for creamy acorn custard tarts, similar to the iconic national favourite, pastéis de nata. We drive here on Alegrete’s advice in search of the only kitchen that makes it. “Alentejo has its own rhythm,” she says. ”And the people here treat each other like family.” This is part of the reason Alegrete quit the cruise ships to settle in the area. After two visits in quick succession I, too, am drawn to the Alentejo’s gentle but ravishing charms. The Alentejo varies strikingly from the hilly and rugged coastline, the central tumbling plains and golden wheat fields, to the heat-singed lands in the south. It’s one of the poorest regions in Portugal with sizzling hot summers and icy winters adding to the challenges faced by farmers and labourers. Traversing the region, we drive (and walk) through ancient walled-towns like Marvão and Monsaraz, frozen in time. We amble past thickets of oak, corn and olive trees, and wild-flower strewn vistas, fat cows at pasture and along calm rivers. Pretty whitewashed houses and boggling Neolithic structures capture our attention. It’s worth hiring a guide in places, and historian Melanie Vagar offers enriching walks filled with snippets she’s researched during her studies and explorations throughout the Alentejo. While many locals visit for fresh air and outdoor fun such as treks, kayaking and even hot air ballooning, Vagar also arranges pottery and craft workshops, museum tours and picnics with local products at the scenic Ribera Grande. Over our stay, we wind our way from taverns and picnic spots, tasting rooms and castles, former monasteries serving dinners and Michelin-starred restaurants transforming the regional cuisine into art, feasting and sipping. Wheat had replaced the vines during the dictatorship and interest was only revived in the late 70s. Still, the region has a global reputation for producing outstanding blends, some at architecturally wondrous estates such as L’and Vineyards in Montemor-o-Novo. There are, we note, very few visitors to the Alentejo in spite of decent signage, roads and general infrastructure. “We need more advertising abroad. The tourism board tries hard, but we need more awareness. 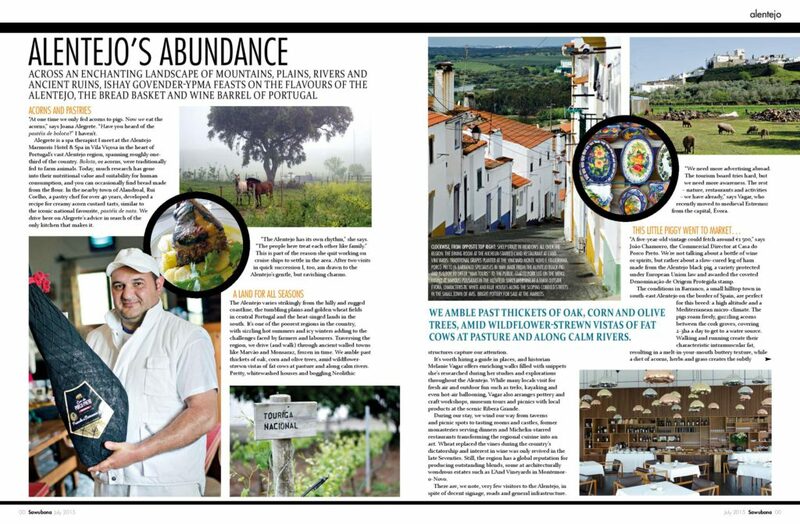 For the rest – nature, restaurants, activities, we have it already,” says Vagar who recently moved to medieval Estremoz, from the capital, Evora. “A five-year-old vintage could fetch around €1500,” says João Chamorro, the commercial director at Casa do Porco Preto. We’re not talking about a bottle of wine or spirits, but rather about a slow-cured leg of ham made from the Alentejo black pig, a variety protected under European Union law, and awarded the coveted DOP (Denominação de Origem Protegida) stamp. The conditions in Barranco, a small hilltop town in southeast Alentejo on the border with Spain, are perfect for this breed: a high altitude and Mediterranean microclimate. The pigs roam freely, guzzling acorns between the cork groves, covering two to three hectares a day to get to a water source. Walking and running creates the characteristic intramuscular fat resulting in a melt-in-your-mouth buttery texture, and a diet of acorns, herbs and grass creates the subtly nutty flavour of presunto. This is the Portuguese (and much nicer, in my opinion) equivalent of Spanish jamón ibérico. During the financial crisis, we are told, many Alentejo pig farmers transformed their livestock into ham, hedging their bets on the popularity of the porco preto. In the more rural areas, communicating in English can be tricky. At the excellent Sever Rio Restaurant in Portagem, the waiter looks up a translation for grelos. Turnip tops, it turns out. Scrambled eggs with farinheira sausage made from wheat flour, fat and seasonings, lamb trotters in tomato and a roast leg of lamb with chestnuts form the beginning of our introduction to very large Alentejo-style portions, par for the course in the countryside. It being spring, the season of lamb, we take advantage of the versions of ensopada borrego on offer – the classic Alentejo lamb stew, a legacy of the Moors who occupied the region around the eighth century. The pousadas – 34 historic former castles, palaces and monasteries across the country, preserve Portugal’s culinary heritage, showcasing the best of classic fare to guests. Expect a variety of egg-yolk and sugar puddings and cakes, recipes developed by the nuns, after the egg whites were used to filter wine. At Queen Santa Isabel’s former palace in Estremoz, we admire art, tapestries and antiques, many of which are too precious to announce a value, says Eunice Tiago, manageress and Alentejo-native. We leave the pousada and walk to the town square. A small produce market is underway, and I watch two old women peeling something that looks familiar. I smell one, offered with an outstretched hand. It smells sweetly of the earth, the rains and the toil of the Alentejo. South Africans need a visa to travel to Portugal, which forms part of the Schengen states. Hire a car at the airport or in the city in Lisbon and pick up a map at one of the tourist offices prominent in each town.